USMS Long Distance National Championship was recently held in Reston, VA, by the local Masters Swimmers outside Washington, DC. The venue is a man-made lake where one lap around makes a mile. On race day the lakefront owners sat on their docks in folding aluminum chairs, smiling and waving at the swimmers. Some of the swimmers smiled back, and some even waved. As it happened, the mile swim was followed shortly by the two mile. A lot has been written about death in triathlon; that it’s frequently in the swim, often by those without a lot of experience in the sport; or that victims are commonly anxious, tense or uncomfortable being in an open water start, for what may be only the first or second time. In Reston, it was someone who was actually quite experienced. This gentleman, 45-year-old Kevin Ruby, was well known to the swim and tri communities—and quite speedy in the water. He swam the mile on this picture-perfect day, winning his age group handily. Then, like many triathletes, even myself on occasion, he lined up to compete in the two-mile swim as well. Following the gun for the two mile (two laps of the lake) he made the turn at mile one uneventfully. But that was the last anyone saw of him, until the following day when rescue teams found his body using sonar in the lake. How Common are Swimming Deaths? Is There Anything Swimmers Can do to Minimize Their Risk? Triathletes are generally a pretty confident crowd, but when it comes to being race ready, what you don’t know can kill you. And although athletes who begin races almost always finish without the need for sonar, it does happen, which means that you might need to ask yourself some tough questions about your health before you line up for your next start. If you have a positive family history for heart disease, at least ask your family physician about your participation in triathlons. Be doubly sure that whatever tests you’ve done are what 21st-century medicine dictates for your stage in life. It might be nothing; or it might be a stress test on a treadmill (take it from one who’s done two; they’re kind of fun!) Depending on your age and fitness level, there might even be more in the way of testing, but it’s worth it to know when you line up at the start that you’re clear to go all-out and meet the demands of the race. 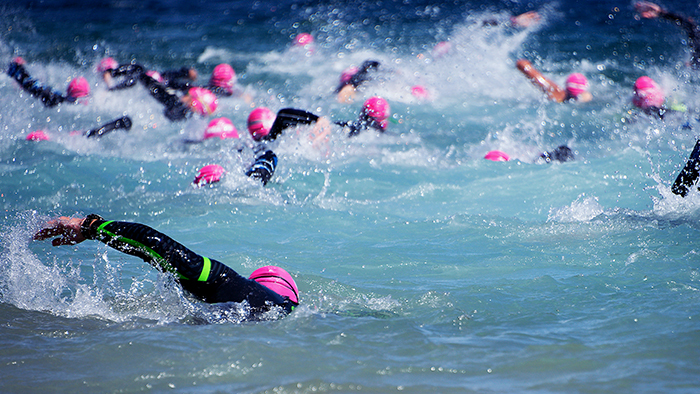 Secondly, it’s important to practice the swim start in the goggles and race wear you plan to compete in. Although this may sound like a silly question, do you know if the race cap will be latex or silicone? Do you know the difference? They fit very differently and you should be at ease with donning either with the knowledge that it’ll stay in place. A slipping cap or leaking googles can quickly turn desperate in the midst of a chaotic swim. Thirdly, how about that wave start? Make you a little uneasy? Sure. That’s a pretty normal reaction. To stay calm, just count to five before you take your first stroke; let the other racers clear out a bit. And if you’re part of a racing community where a death or tragedy has occurred, it might be worth sharing your concerns with your teammates or friends to help work through any latent anxiety. Lastly, how much of an inconvenience is it to get the race site with a swim buddy the day before? Or the week before? Or both? On race morning as you wade into the water, it will be old hat. You’ll just be sharing it with a few friends. And don’t be shy about asking your fellow competitors about anything you’re unsure about. Most of us in this sport are happy to assume the role of teacher to reveal the finer points of the swim you are about to do. We may never know what exactly happened to Kevin Ruby after that one-mile turn. It’s entirely possible that his was just a terrible accident that couldn’t have been foreseen or prevented. But if you have any qualms about your own health, or anxiety going into a swim, just remember you can take as much time as you need to make sure you’re solid before you toe your next start line.